Discovered in Crater of Diamonds State Park, near Murfreesboro, Arkansas in 1977, the Kahn Canary is considered to be an unnofficial symbol of the state. Bought and named by Stan Kahn of Kahn Jewlers in Pine Bluff, Arkansas, the Kahn Canary has been lent to Hillary Rodham Clinton to wear at her husband's inaugurals, both as Governor of Arkansas, and as President of the United States. The Kahn Canary is very rare in comparison to other diamonds. Because of its flawless condition, fairly bright surface and pleasing natural triangular pillow shape (a macle crystal), the it has remained uncut. Its strong yellow color and brilliance impress all those who see it. Because of its natural, uncut form, the Kahn Canary is a perfect example to represent Arkansas, nicknamed "The Natural State". 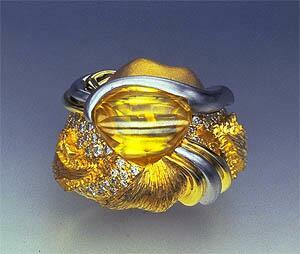 The diamond is presently mounted in a ring custom-designed for Mrs. Clinton for the January, 1993 Inaugural. The diamond was discovered by George Stepp of Carthage, Arkansas. He later sold the stone to Kahn. Crater of Diamonds State Park is the world's only publicly-owned diamond site where visitors may search for diamonds and other gems and keep what they find, regardless of the value of the stone. It is one of the state's bigger tourist attractions. The park's 36½ acre search area is the eroded surface of a craton -- an ancient gem-bearing volcanic pipe. Besides diamonds, other precious and semi-precious stones are found within the volcanic matrix such as garnet, amethyst, jasper, agate and quartz.